I was stripped of all my own desires and wants when I was married to my ex-husband. I now carry a list with me–a list that will help me choose a man that will put me first in life. Then the storm cloud of an entitled millionaire appears in my life and knocks me off my axis. This man sends so many mixed signals, my body either quakes with anger or passion when I’m around him.I’m his son’s teacher and his tenant, but I find myself wanting more. My life is run with precision with little regard for others until a woman in crazy clothes challenges me to be a better father. She’s one of the few people that puts me in my place and maybe for this very reason–I want her more than I can articulate. With her failed marriage and list of requests she needs from her next partner, I know she’s my future. My life is less than perfect, and with it–baggage that follows me everywhere. Does she want my kind of crazy in her life?I’m her landlord and an a**hole, but I find myself wanting more.Where to begin? 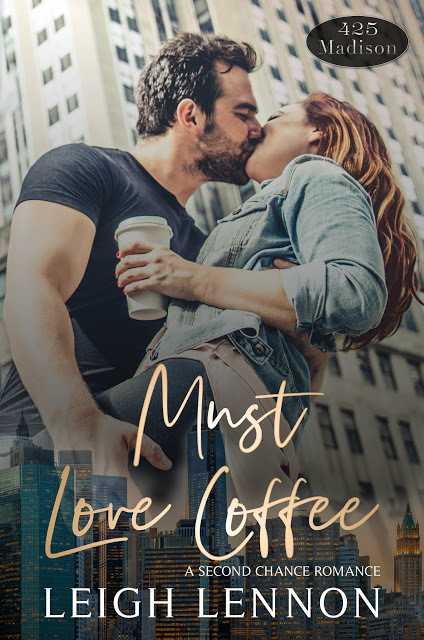 For starters, you must love coffee…After all, 425 Madison Avenue is the perfect place to fall in love.Each story is a complete standalone. Leigh Lennon is a mother, veteran and a wife of a cancer survivor. Originally with a degree in education, she started writing as an outlet that has led to a deep passion. She lugs her computer with her as she crafts her next story. One could say she loves pretty nails, big earrings and spiky hair. She can be found drinking coffee or wine, depending on the time of the day.